The original Stage, launched by Nord in 2005, gained instant popularity with live performers as well as studio bods. The Stage 2 concept has not strayed from its portable predecessor, which boasts of great sounding piano, electric piano, organ and synth sections along with flexile controller functions and effects. Weight and form factor remains unchanged. This hammer action model has been tweaked to give it a Nord Piano feel. Also, a considerably shallow downward key travel ensures negligible sluggishness. Intuitive interface of the Nord Stage 2 HA88 model is unlike other keyboards whose unintuitive interfaces obstruct your creative flow. It has minimum reliance on screen allowing you to make most sound tweaks without looking at the screen. However, tweaking extra system parameters requires you to look at the screen. The new model addresses the major downslide of the original Stage model, enabling users to upload samples (chords, beats and WAV files using Nord Sample Editor). Lack of access to Nord Sample Library was another point of criticism which has been looked into. The sonic palette has been indefinitely extended with the new HA88’s support for instruments from Nord Sample Library. Increased memory in the Stage 2 lets you load larger and many more piano samples. Authenticity of piano samples has been enhanced by string resonance features and long release options. The Nord Stage 2 is easily the best piano engine available. A vast range of new acoustic samples may be availed from the Nord website. The new Stage 2 model comes with a “slot detune” option. This feature allows you to have two pianos one each on Slot A and Slot B. You may now put in phasing or chorusing effects with subtle detunes. An upgraded organ complete with the latest tone-wheel modeling technology from Nord is another key improvement of Stage 2. There has been noticeable enhancements in the chorus, vibrato, percussion, rotary and drive emulation. Unique and authentic sound of Nord’s samples makes it a favorite with reviewers. 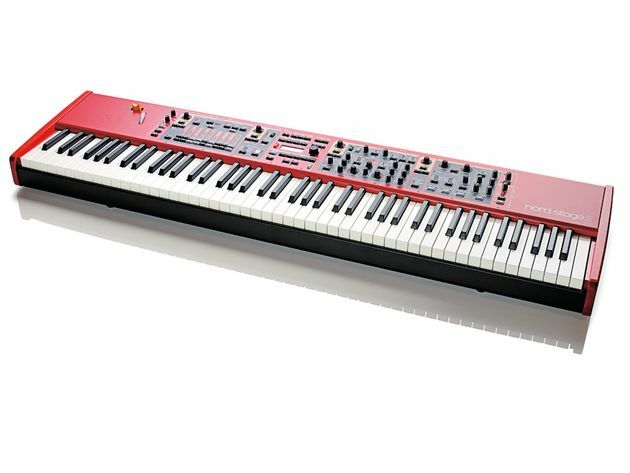 The new synth section based on Nord Wave is much more user-friendly and easier to use.It comes with dedicated envelope controls, LFO and arpeggiator – all of which may be sync’d to MIDI clock. Wavetables, a powerful FM synth and the new multi-mode filter add to the pros of the Stage 2 HA88. There has been a considerable improvement in sound from the original Stage version. Effects such as the Univibe effect, delay effect, and new amp emulations (Jazz chorus and Fender Twin) can all be synced to the master MIDI clock function now. The MIDI spec has been given the latest 1.30 update. This facilitates easy communication of Stage 2 with MIDI equipment and computers. The sound, software and features of the HA88 have been considerably improved with proper follow up of the shortcomings of the original Stage model. It is hard to beat with such a huge upgrade. The status of the Stage 2 has clearly been cemented as the most authentic piano/organ/synth available for stage. Play it all day, for its amazing sound and an even more amazing key bed. Digital Piano vs Keyboard: Which one is the better choice? BestDigitalPiano.net is a participant in the Amazon Services LLC Associates Program, an affiliate advertising program designed to provide a means for sites to earn advertising fees by advertising and linking to Amazon.com. Certain content that appears on this website comes from Amazon.com. This content is provided 'as is' and is subject to change or removal at any time without prior notice.